The Model A Ford parts specialist. O'Neill Vintage Ford. Oops! We must have moved that page. If you use the search box or the links below, we are sure you will find what you are looking for. 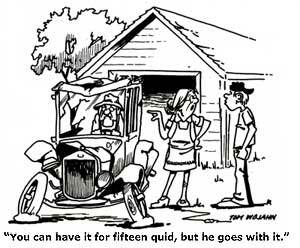 Here at O'Neill Vintage Ford, we offer over 2500 Model A Ford parts. We also offer a range of Ford V8 Parts. The 32 Ford (or Deuce as they are commonly known with hot rod enthusiasts) started this phenomenon when Henry Ford launched his V8 powered car in 1932. Books are 'must have' items for the Vintage Ford Enthusiast. We also offer instructional DVD's for the Model A, filmed during some popular technical seminars in the United States. View our Ford books. The Brooklin Models Collection represents over four decades of the American Automotive industry with new models being introduced on a regular basis.